Now Accepting Appointments at Cardinal Orthodontics in Ballwin! Cardinal Orthodontics’ second location at 15028 Manchester Road, Ballwin, MO, 63011 is officially accepting appointments for children and adults beginning Thursday, January 4th, 2018! Schedule now to reserve your free initial exam! Free 3D retainers for life! As your Ballwin orthodontist, we provide a full range of orthodontic treatment. Invisalign care including metal and clear braces. Modern technology has come a long way to help make orthodontic treatments faster, less painful, and more convenient with an average treatment time of 16 months. The Cardinal Orthodontics Ballwin office is located off U.S. Route 66, at the corner of Manchester Road and Sunnyside Court. We’re minutes away from several businesses and schools including Ballwin Elementary and Selvidge Middle School, so you don’t have to worry about missing work or school with our convenient appointment times. 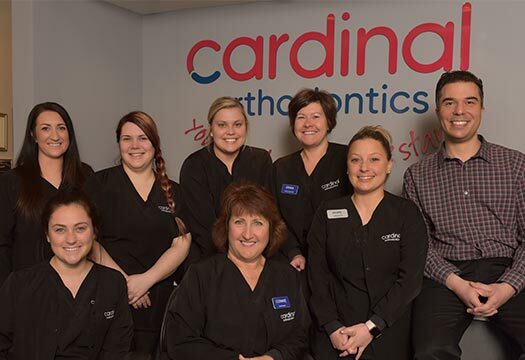 The professional team at the Cardinal Orthodontics is ready to assist with all your orthodontic needs! We’ll answer any orthodontic questions you may have about treatment and payment options. Get started on your beautiful smile, call 314-962-6242.